© 2018 Virgin EMI and Republic. All rights reserved. 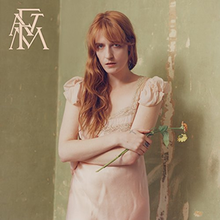 On her band's fourth studio album, it's like Florence Welch can hold out a single note at top volume for an hour. High As Hope’s charming and discombobulating diversity/dynamics makes it an absolute aural onslaught. That said, I hope you’re a fan of Welch’s heaven's-crescendo formula. Someone once described Florence + the Machine as something akin to “being in a new wave church,” a description I find remains as pertinent as ever. High as Hope marches into 2018 as Florence Welch’s most pious record, albeit about subjects she finds worthy of her faith: her hometown, the LGBTQ+ community, and Patti Smith. These subjects arrive alongside themes and musical elements we’ve seen from How Big How Blue How Beautiful: big open skies, menacing religious undertones (“Drumming Noise”), booming percussion (“What Kind of Man”, “Blinding”). As a result, High as Hope highlights Welch’s creative power. “I thought I was flying but maybe I was dying,” she laments on “Sky Full of Song”, where her formerly combative nature takes a backseat to introspection. Florence Welch exudes that same omnivorous taste, combining synths, harp glissandos, and even a few horn fanfares and pianos into something fresh. Lyrically, High as Hope forsakes Welch’s knack for vibrant imagery and symbolism for more human modifiers and concerns. While it allows her to share more personal information, Welch aims for straightforward songwriting. Lines like “Give me arms to pray with/instead of ones that hold too tightly,” are beautiful and observant, layered with meanings to digest as you listen to High as Hope in the midst of a summer storm. “End of Love” is as gorgeous as any Florence + the Machine song has ever sounded; the harmonies literally open the heavens. The most fascinating track, the ghost-ing ode “Big God”, also offers a brief glimmer of where Florence + the Machine could go from here. The 1:32 mark gives you a moment of glitchy, synthetic elements the Machine might consider adding to their repertoire. High As Hope may just be a better record than the one it follows. It chisels at How Big How Blue How Beautiful and Ceremonials’ baroque marble sculpture to reveal something smaller and more appealing. Alas, no track on Florence + the Machine's latest can match the celestial height of “Shake It Out” or “What the Water Gave Me”. A great way to approach High As Hope is by thinking of it as a jam session, where both Florence + the Machine experiment news ways of making music and detailing experience. It allows for a mishmash of elements and influences to come together in a cathartic and ultimately rewarding experience, one that feels finalized by the album’s closer “No Choir”. Florence Welch has successfully created a vessel of her own, one shaped by an appreciation for the past and a keen vision for the future. It’s no wonder it feels very now.